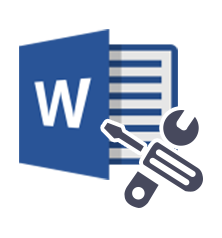 Microsoft Word DOCX recovery software is an effective and efficient solution to repair DOCX file, which are severely or less corrupted. The product provides user-friendly interface and benefits users with alternative to recover deleted DOCX data. Items like text, formula, images, UNICODE character, etc., will be retrieved within couple of minutes. 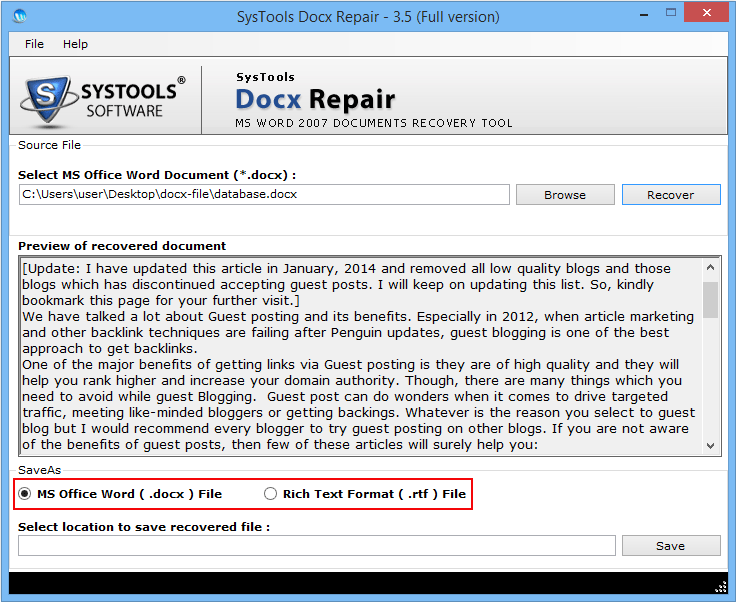 The software recovers DOCX file data, which are inaccessible while working. The data from severely corrupted Microsoft Word DOCX files will easily get extracted with the software. The file showing errors like unable to read, aaa.docx cannot be opened, etc., will get easily opened with this tool. The application to repair DOCX file applies three different recovery operations on the corrupted file. It analyzes DOCX document, verifies data from it, and repair it to handle with severe file corruption. Also, there will be no data loss or any modification in data formatting while tackling with the damaged Word file. After repairing DOCX file and recovering data from it, software provides 2 options to save extracted data. These options are DOCX and RTF. DOCX option will help users in saving the damaged file in its same healthy format. On the other hand, RTF will be creating file in a way that it will be working with multiple programs. 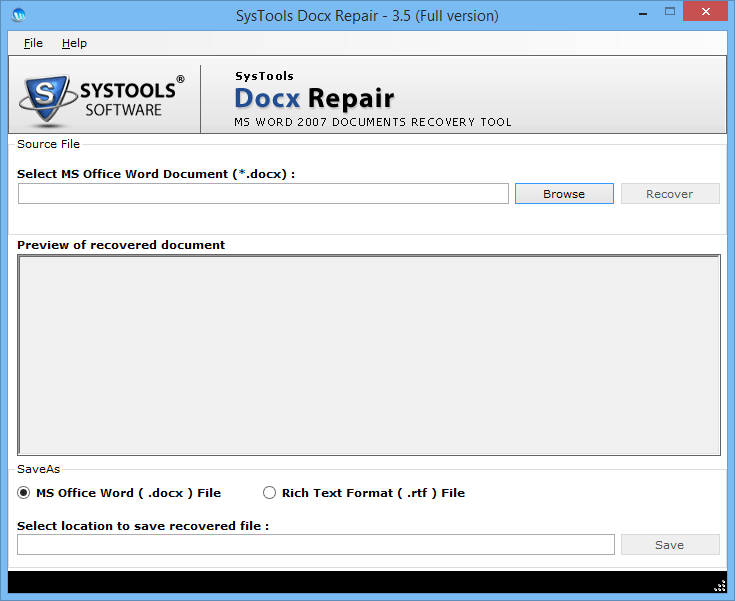 What type of content is recovered by this DOCX repair software? The DOCX recovery software retrieves all kind of data from the added DOCX file. It will successfully extract formulas, images, text, table, etc., in same format as the original one. 2. Does this software supports more than one DOCX file at a time? No, at one time, the tool processes only one file at a time. It will recover deleted DOCX data from a single file without any hassle. 3. Is it mandatory to have an additional program to work with your DOCX repair tool? No, not at all, even if the Microsoft Office suite applications are not installed then, also the software will be working in a flawless manner. "My DOCX file of MS Word 2013 suddenly got corrupted because of the virus attack on my machine. I was not having any single idea that how to deal with such files? Then, I searched for recovery software and I am grateful to this DOCX repair tool. This helped me in getting back my data from damaged file. Thank You"
"I would like to thank my sister for helping me a lot by providing solution to repair DOCX file. I am an enterprise users who saves essential data in .docx file. Due to some unknown reason, all my files got corrupted and I became very much tensed. Immediately, I ringed my sister and she recommended me to use this product. I got back all my unhealthy DOCX files back in healthy form and that too without any data loss." Copyright © 2019 PURCHASESOFTWARE™ All Rights Reserved.